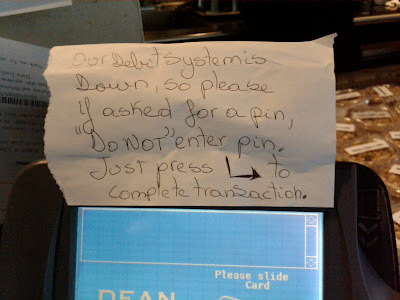 actually, what you must do is mime entering your pin, but really press the arrow. The machine is finicky. Thanks, Scott. But seriously - if no pin is required, wouldn't this be a great time to steal bank cards? Where is this ATM, anyway? no need for a pin code, just randomly enter stolen ATM cards and its spits out cash!